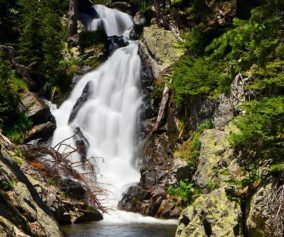 The hike to Lawn Lake in Rocky Mountain National Park follows the course of the Roaring River for 6.2 miles to a stunning high mountain lake with great fishing. 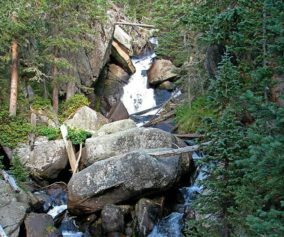 This demanding hike takes adventurers into the heart of the Mummy Range, a lesser visited region of RMNP. 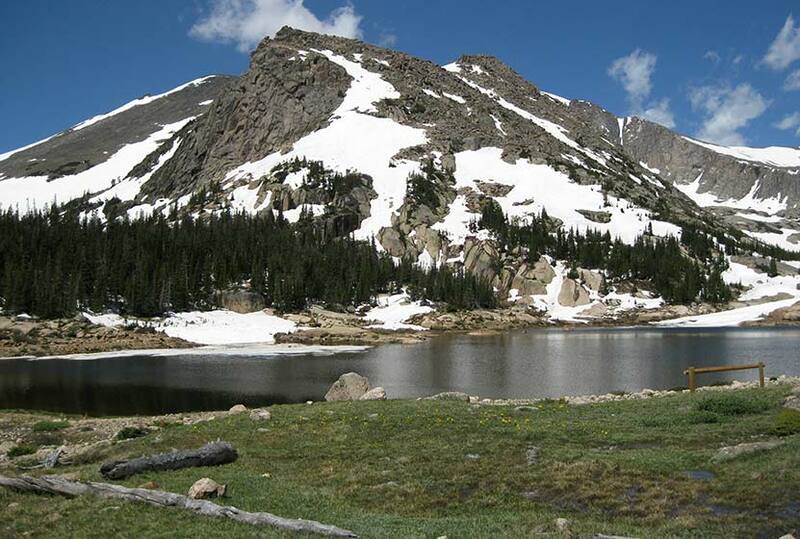 Explore the full Lawn Lake hike profile below for trail map, driving directions, and more tips and details to help you enjoy this adventure in Rocky Mountain National Park. We recommend the National Geographic Trails Illustrated Map – topographic with detailed information. The hike to Lawn Lake begins at the Lawn Lake Trailhead. 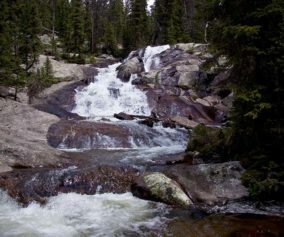 Several other destinations in this lesser visited section of RMNP known as the Mummy Range, can be accessed from the Lawn Lake Trailhead, including Ypsilon Lake, Ypsilon Falls, Chipmunk Lake, and the Spectacle Lakes. The parking area is located on Old Fall River Road, just north of the intersection of Old Fall River Road and Highway 34. The hike begins on a 1.4 mile stretch of the Lawn Lake trail before the intersection with the Ypsilon Lake Trail. This initial segment climbs a series of switchbacks. While it may be tempting to cut the switchbacks, they are there for a couple important purposes: to control erosion and to preserve your energy. Because this area of the park has been severely damaged by floods, it’s all the more important to stay the trail. Here, the trail comes quite close to the gorge that overlooks Roariing River. There are areas of unstable terrain and hikers should take caution and stay away from the precarious edges of the gorge. The trail begins a demanding climb up a series of switchbacks then returns to follow river. 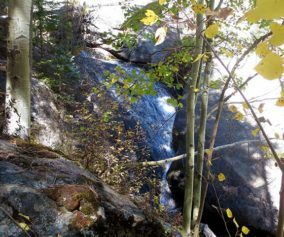 Three backcountry camping sites are located in this stretch, just after the confluence of Roaring River and Ypsilon Creek: Ypsilon Creek, Cutbank, and Golden Banner. At 5.6 miles, the Lawn Lake Trail meets up with the Black Canyon Trail. Here, the way to Lawn Lake is left/North, and should be clearly marked by a sign at the junction. Lawn Lake is about 1/2 a mile further up the trail. There is another backcountry camping site at Lawn Lake. This site and the others along the Lawn Lake trail can be reserved through the RMNP Backcountry Offices. Greenback Cutthroat trout are plenty in Lawn Lake, so this makes for a great fly fishing destination in Rocky Mountain National Park. A fishing license is required and State and Park fishing regulations apply. Explore More: Crystal Lake is just about 1.5 mi further. You may opt to continue if you have energy to spare. Get there early: Parking may be somewhat limited as with many hikes in RMNP area and can get full even early in the morning. Recommended Trail Map: We recommend the National Geographic Trails Illustrated Map which indicates the location of the Upper Chipmunk Backcountry Camping Site, and provides topo information. Photo: We would like to express our gratitude to Chad Bowman for sharing such an amazing photograph of this hike to Lawn Lake in RMNP.